What Does the Gut Have to Do with the Thyroid? 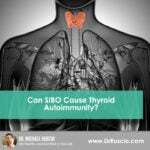 Can SIBO Cause Thyroid Autoimmunity? Is Selenium Supplementation Helpful or Harmful for Autoimmune Thyroid Disease?